All the classic “lane and tower” MOBAs play at least somewhat the same. Whether it’s Dota 2, League of Legends, Heroes of Newerth, Heroes of the Storm, or something else, they all have similar elements, with just enough differences to draw players from a competing title — and to avoid copyright infringement lawsuits. “Copyright infringement” isn’t a term that’s well-understood (or applied) in China, however, so Riot Games now finds itself embroiled in a lawsuit with a Chinese developer that’s made a game that’s just a little too like League of Legends — at least from Riot’s point of view. contains (or at one time contained) a vast array of elements that were directly and deliberately appropriated from LoL, including but not limited to LoL’s characters, artwork, map designs, and unit and monster designs. Riot also accuses Moonton of “overt gamesmanship,” using a logo similar to LoL’s and creating a product that it knew would invoke Riot’s wrath and “made only the most minimal adjustments” to its previous games, Magic Rush: Heroes and Mobile Legends: 5v5, once Riot responded. You can see for yourself in the latter part of the lawsuit all of the points where Riot claims that Moonton’s games infringe upon League’s copyrights, including a number of exceptionally similar characters. Magic Rush: Heroes even has a werewolf character named “Jacob,” so maybe Twilight’s lawyers — which I know from personal experience can be very aggressive — can get a piece of them too. that Jacob is not in the game, I have the game installed and I don’t see any character called Jacob or using similar skills shown above. Also, there are more games, along with Mobile Legends, that use lot’s of Dota2/LoL hero design, there was a hero (reworked now) that worked identically as Veigar, there are heroes that resemble Lee Sin a lot, lot’s of Dota2 heroes also. Does anyone remembers HoN? It had straight copy/paste heroes from Dota2 only under different design/name and untill Valve reacted they kept making them. They are still in the game, they just stopped copying. So yeah… long shot. I even think this is fake news tbh. 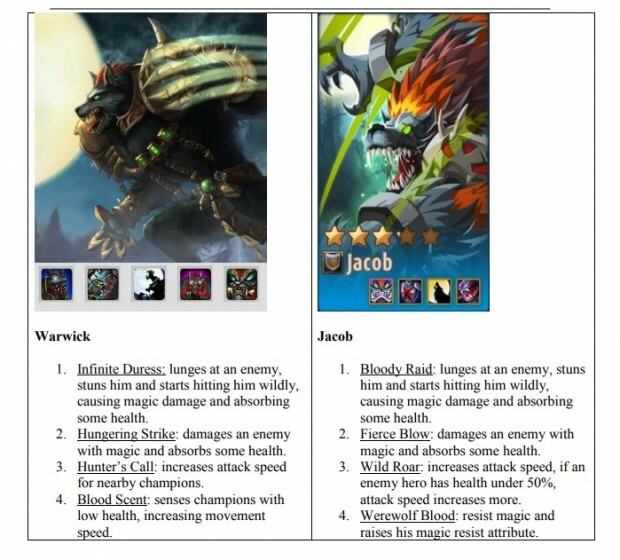 Thanks, we’ve updated the piece to indicate that the Jacob image comes from Moonton’s other game, Magic Rush: Heroes. HoN was made before Dota 2 was planned by Valve, and was meant to be a stand alone version of Dota. S2 had permission from Icefrog to use hero designs from Dota. why report it, it’s advertised (or was) all over facebook. RIOT knew about it before u did but that’s no excuse to be a little b*tch and report it. I’ve played it myself, very good game, not good enough to keep me playing it as I quit months ago but RIOT should definitely follow in their footsteps. 100% obvious clone though, yes. They don’t even try and hide is the map is EXACTLY the same, bushes in the exact same place. With all the design they put into it, they could have easily made some minor adjustments. Clearly it’s a huge market and the only way to get on top was to give people what they want and that’s a direct clone of LoL to the mobile device. Someone should sue Riot for DOTA and Warcraft 3 copyrights. Fairly sure they won’t win. Chinese companies often get away with pilfering game assests. Look at most browser-based games, they have the same artwork and even mechanics, areas and assests throughout. Riot is now owned by a Chinese conglomerate. They wouldn’t be so easy to dismiss, even in a Chinese court. Riot is a subsidiary of Tencent, lol.